Knife is now in my possession. Gorgeous patina, and a gorgeous knife! I've a feeling I'm gonna love the profile (though the handle-to-choil gap leaves me wiggling my finger in search of the position). but right before taking the knife to the post office I found the actual list. Correct me if I'm wrong, but Cutuu is next - and last - on the list, yes? Can u pass me. I'll be out of town, sorry. Last edited by CacahuateSommelier on Tue May 08, 2018 12:21 pm, edited 1 time in total. I will open for eight participants initially. It is one of my favorite knives and I don't want to be without it for all that long. This Yahiko is one of the flatter knives on the site, but it's a bit more versatile than it looks. I can even "slide-rock" adequately enough on fresh herbs. Obviously it's a good chopper and push cutter. This knife is not the sharpest, the thinnest or the flashiest. It's just a damn good knife in my opinion. Got classy good looks and just feels very comfortable to me in the hand. A smooth cutter. 500 posts. If you are board regular with less than that, feel free to PM me if spots are still open. First dibs to anyone whose knives I've used in a passaround if they respond in 48 hours. Treat the knife as your own. Sharpen on high grit stones preferably, but grade A sharpeners can go further if needed. Five to seven days per person. Post here when you ship the knife out and alert the recipient. 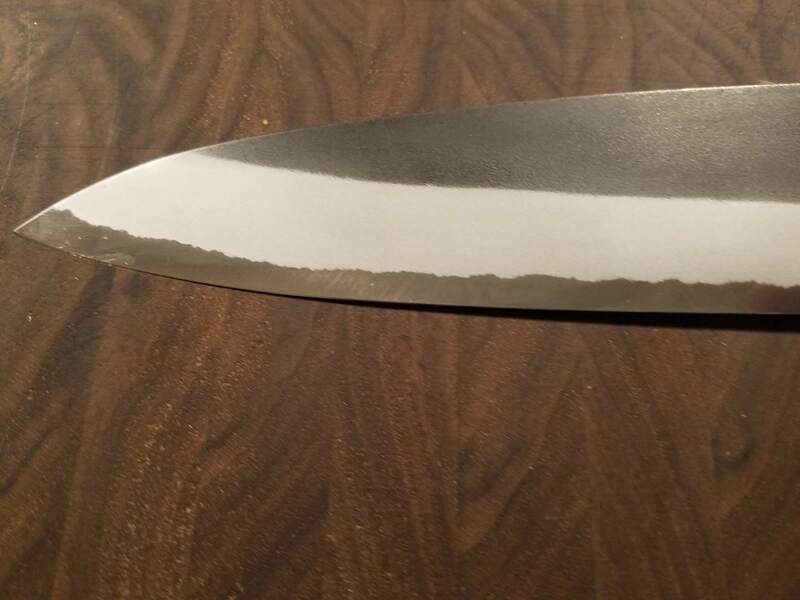 PM me if there are any problems or damage to the knife. Thanks for checking and adjusting! Sorry, Cacahuate, I never did see this post. Just saw it now. Had I seen it I would have had it sent along to you. My apologies. I just picked up the sister knife, the Yahiko Kurouchi, so I could compare the two. 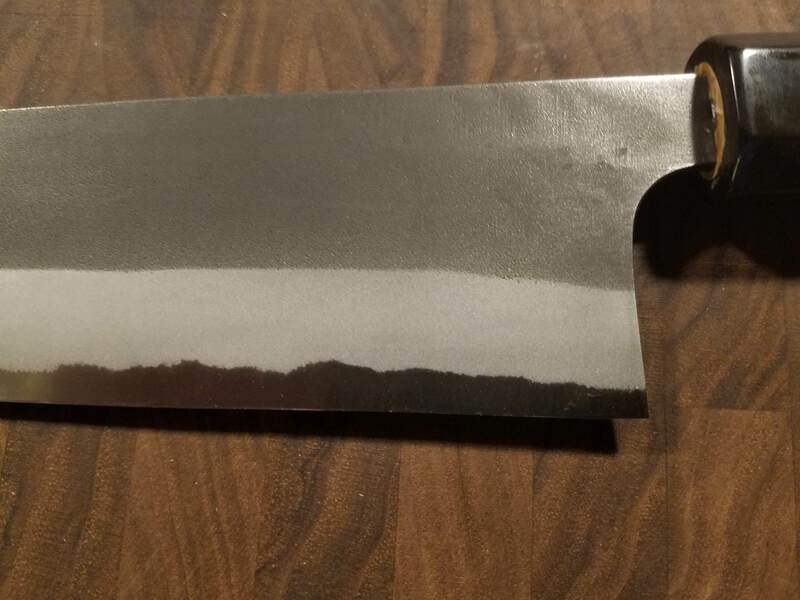 The photos are of the knife just out of the box. Some lint or paper is still on the edge. Very similar knives as expected. I don't think there will be much difference in performance. The Kurouchi is 1 mm longer at 245 mm. It's a touch heavier at 6.45 oz vs 6.3 oz for the Nashiji. The Kurouchi is a little over 49 mm tall. The Nashiji maybe a hair under. Very close. Biggest difference I can see is the Nashiji is a bit flatter. Not by a lot, but it is. The Kurouchi is $30 less for some reason. Just $215 new vs $245 for the Nashiji. I'd rank the Yahiko Kurouchi as one of the best deals on CKTG, right up there with some of the Makotos. Fit and finish punches way above the price range. I am guessing the Nashiji costs more because of the finish. The Nashiji is prettier. Yet the Kurouchi looks much nicer than I expected. Very smooth blacksmith finish. These are very impressive knives. 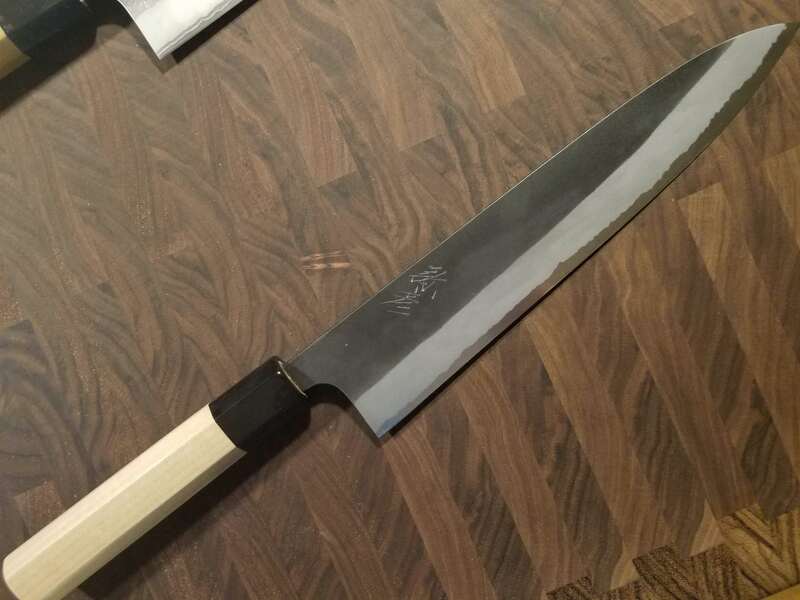 Whether you buy new or used the Yoshikane knives masquerading as Yahikos (including the "Ice) are well worth it. I plan to test these two side by side and keep the one I like best.